The crazy rise in the popularity of beer has brought with it an increase of beer snobbery. It’s not a new phenomenon. Beer snobs have been there all along. But as more and more people get caught up in the frenzy, the level of puffery has definitely inflated. In part it’s just a numbers game. The snob quotient increases proportionally with the size of the crowd. I want to differentiate between beer snobs and beer aficionados. Aficionados often make statements that seem startlingly similar to the utterances of snobs. But aficionados can back those statements up with actual knowledge. They don’t wear that knowledge as a badge or use it as a tool to inflate their own importance or superior taste. Their enthusiasm comes from a place of real interest in the beverage and a desire to share it with others who are interested. And okay, maybe sometimes foist it onto those who really aren’t. Some beer snobs also possess authentic knowledge, but many know just enough to make them think they know a lot. In either case, they use their knowledge as a sword to smite the ignorant and those who might profess to know more than they. Their pronouncements are ego strokes, designed, consciously or not, to inflate their own status above that of others. It’s not about the beer. It’s about them. 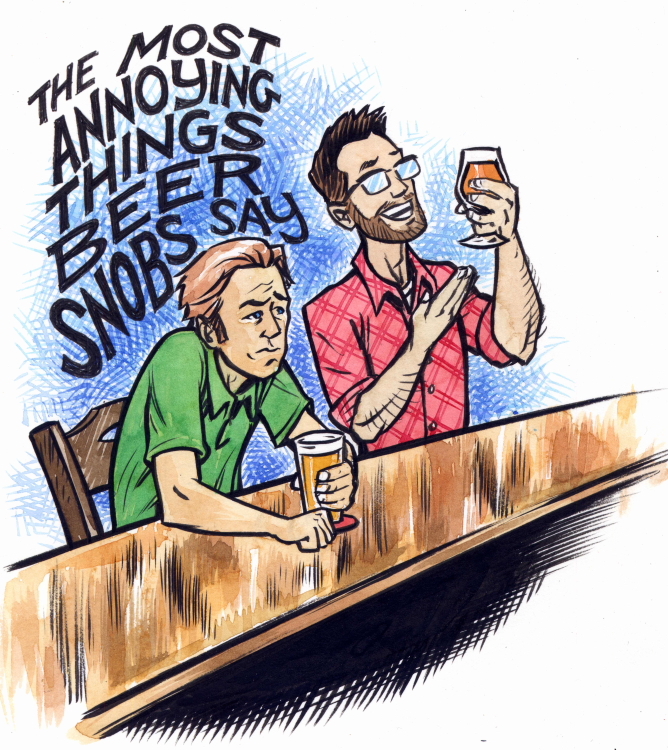 Here is my assessment of some of the most annoying things that beer snobs say. Many of these quotes were lifted directly from Facebook comment threads. Translation: I’m old. I feel the need to justify my massive beer consumption. I resent the influx of all you new people into my exclusive club. Your presence is pushing me from the position of prominence that I once held in that club. My longevity and voluminous quaffing make me an expert. You should listen to me. Translation: Don’t you wish that you were me? Envy is a powerful tool for beer snobs. Making you want what they have bestows on them importance. They can don a cloak of expertise based on their recognition of the noteworthy and their ability to procure it. The more casually that authority is asserted, the more persuasive it becomes. It’s not forced, it’s presumed. The status-symbol beer is just another tool to seal the deal with others. If you really want to know how it tastes, open it. It’s just beer. Maybe it means that the flavor was gauche or in poor taste. This is also a difficult concept to grasp. Was the tasteless flavor somehow an affront to cultural sensibilities? The beer in question here was from a larger craft brewer whose beers are widely available. Maybe the drinker has a preconception about the beers from this particular brewery based on size or some other criteria. Did they judge it before they even tasted it? A truly snobbish thing to do. Read more on this below. Or could it be that the problem lies not with the beer in question but with the overconsumption of über-hoppy ales? With IBUs of 100-plus and bucket loads of flavor and aroma hops, it’s impossible that a double IPA will not have flavor. Even a bad one will taste like something—probably quite intensely. But those abrasively bitter beers are notorious palate wreckers. After drinking one, you really can’t taste anything else. I hope that next IPA was better, but I doubt it. Think back to last week. How well do you remember that new beer you tried mid-week? Can you describe it in detail? Would you be able to pick it out of a lineup of similar beers? Chances are you couldn’t. Without significant effort and a well-developed flavor vocabulary to back it up, our gustatory recognition memory is just not that accurate. The deficit becomes especially acute with moderately experienced tasters. For those with tasting experience but a lesser vocabulary to describe it, a cognitive dissonance occurs that leads the brain to accept a lesser verbal description over a more detailed sensory experience. It’s called the Verbal Overshadowing Effect and it leads to faulty recollections. The context in which a beer is consumed affects one’s experience and memory of it. What were you doing when you sipped last year’s brew? Were you lounging lakeside at a cabin up north? Were you celebrating with close friends? Or were you sitting alone under dim light at the dining room table studiously scribbling notes in your tasting log? What about this year’s version? One situation might make a beer seem much more appealing than another. I suspect that most of us don’t really remember last year’s version all that well, much less the one from the year before. We might recall some basic characteristic—“It was sweeter that year.” But the details are lost in the haze. Craft beer is all grown up. It isn’t an infant in arms anymore, nor a rebellious teen. It’s an adult—a fully-fledged, multi-billion-dollar industry. It’s an industry experiencing rapid growth of a kind not seen in this country since the second half of the 19th century when once-tiny companies like Miller and Anheuser-Busch became the first national, beer-making powerhouses. As in any industry reaching maturity, certain things are going to happen. There will be acquisitions. There will be consolidations. And some successful breweries will get big. Big is not necessarily bad. Let’s face it: there are plenty of small breweries out there making bad beer, and many big ones making great beer. If we want craft beer to grow—and I think we all do—then we need to applaud success. Certainly there are many models of success. Successful though they may be, continued expansion won’t be sustained solely by breweries that service only a few city blocks. Craft beer is a grassroots phenomenon, but some national clout will give the movement stability. The only thing that really matters is that the beer stays good. But for beer snobs it’s about exclusivity. Acquiring the beer from that obscure farmhouse brewery with extremely limited distribution puts them on the inside. They get to be one of the cool kids. And they will make sure everybody knows it. Expanded availability is the enemy. How can a beer make them important if everyone can get it? To them I say, if not for the likes of Sierra Nevada and Boston Beer Company, this current craft-beer phenomenon would not be happening. That boutique beer that they adore would not exist. They would still be enjoying homogenous lager and would likely be none the wiser. Those breweries were the pioneers, the ones who pushed out fuller-flavored beers when nobody wanted them. And they continue to support the industry in ways that only their size makes possible. Given the depth, breadth, and quality of what they make, Sierra Nevada is arguably one of the best breweries in the country. Greater availability is only a positive in my mind. Sam Adams invented the modern idea of extreme beer. And the sale of Goose Island to AB-InBev has been a net plus for that brewery. It’s allowed them to expand production of their Belgian-style and barrel-aged brews. But hey, if the snobs stop snagging all the Bourbon County Brand Stout, maybe I’ll be able to get some.